In 1996, B. J. Johnson & Katie Neitart created what may be the best kayak music video ever made. That video was Fallin Down, the first of five great classics - works which defined both kayaking and kayak videos. Started just as boats were becoming smaller and drops bigger, this series star a veritable who's who of kayaking - names that were big then, and young up and comers who are big now. This disc includes the first two of this classic series. Scroll down to read about each. 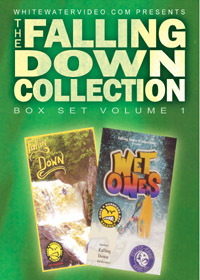 Now 3 of the classic videos from Falling Down are available on a single DVD! See most of the big name paddlers of North America styling awesome class V creeks from all over the continent. This disc includes Over The Edge, Freshwater, and Free Flow. Check below for individual descriptions of each. This fun music video includes both car and boat abuse. There is no narrative and hardly any talk as the Falling Down crew plays on huge waves and holes on the New River at flood stage. They also take us to tight technical steep creekin in Michigan, British Columbia, Minnesota, and New Hampshire. Look for the Cascade River, NH; Onion River, MN and Wolf Creek, WVa. Listen to the music during Zone Dog Bobby Miller's piece. The latest after a long hiatus by Katie & BJ. This one has some great stuff in it! The High Falls Gorge of the Ausable is waay impressive. You'll also find all the usual expert boaters running this serious class 5+ whitewater.... BJ Johnson, Leland Davis, Clay Wright, Allen Braswell, Shannon Carroll, Tao Berman, Dinver McClure, and many more. Shannon Carroll runs a 78 foot drop near the end of this big drop, steep creekin tape. A classic from Falling Down Productions, this one is sick! Awesome kayak footage with kickin music. Lots of Freestyle Rodeo, huge drops and carnage on Mann's Creek & California's North Fork of the Stanislaus. Extreme kayaking on steep creeks and rivers all over North America. World class freestyle, four first creek descents and outrageous crash n' burns from BJ Johnson, Clay Wright, Katie Nietert, Colby Mackley, Tao Berman, Shannon Carroll and Tracy Clapp. No narrative, just great, kickin' music! The Intel 4.1 demo file will look much better if your PC has the drivers to run it.